As spring has already graced many corners of the globe, Azerbaijan is getting ready to celebrate its most cherished holiday and favorite tradition - Novruz Bayram. When the sun moves from the southern hemisphere to the northern hemisphere, the equinox takes place - equal hours of day and night. This marks the end of winter and the beginning of spring. It is at that time that Azerbaijanis celebrate beautiful Novruz -- the first day of spring, the revival of nature. Novruz, symbolizes the awakening of natural life and marks the end of an old year and beginning of a new year. Being not a religious holiday, but rather a tradition, one dating back to Zoroastrianism, the oldest of the monotheist religions, it is the most beloved holiday of all Azerbaijanis. The holiday is loved by both children and adults, as it is a celebration not only of the vernal equinox, but also equality, communion and unity. Novruz brings people of different backgrounds together, strengthening mutual respect and peace in society. 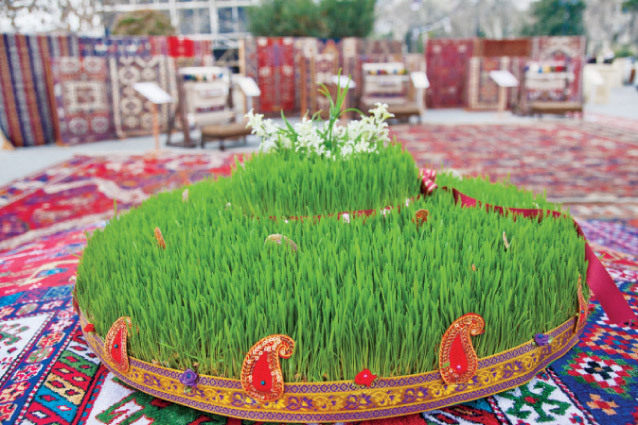 Novruz celebrations begin a month before the actual holiday, which is marked on March 20-21. Preparation for the holiday begins with Water Tuesday, or as it is known here, Su Chershenbesi, following by Fire Tuesday (Od Chershenbesi), Wind Tuesday (Yel Chershenbesi) and Earth or Last Tuesday (Torpag or Akhir Chershenbesi). The four Tuesdays are associated with the arrival of the new year and nature's rebirth and dedicated to the awakening of one of the natural elements. People try to meet the holiday with clean houses, believing that “a good beginning makes a good ending." So, many people are busy with the tiding up of their houses and yards on the eve of the Novruz. Almost every family in Azerbaijan will celebrate the holiday with green Semeni. It is some kind of ritual, which is usually accompanied with the song "Semeni, save me and I will grow you every year." Long before the holiday, about two weeks earlier, people would have sown wheat or lentils on saucer. By the time the holiday arrives their green shoots reach 5-7 cm and become indispensable decorations on many tables. Such attributes of Novruz table as pakhlava (baklava), shakarbura (a cookie with nuts and sugar wrapped in dough), and shorgogal ( layers of pastry flavoured with turmeric and fennel seeds) decorate almost all Azerbaijani tables. All these sweets are associated with star, half moon and sun, respectively, as their shapes remind these symbols. Novruz is also famous for its bright customs - such as placing hats at a door is probably the most favorite one among children. They enjoy knocking on neighbors’ doors and then hide, waiting with anticipation for the treats they will get. Another interesting aspect of Novruz is its divination tradition. Mainly young unmarried girls will get together to know when they will get married or find out whether they will fulfil their dreams. Although people do not take this tradition seriously, they're still keen to keep the ancient ceremony alive, a link to the country's rich history.